After some very positive feedback on last week's article on choosing the best rod for each angler, it became obvious that an article detailing a few suggestions on choosing the right reel was necessary. With the huge range of fishing reel brands and models on the market, choosing one isn't always as easy as picking what channel to watch on television at night. The first thing you have to decide upon is what you are going to use the reel for; general estuary, boat-based lure flicking, sports fishing where you target something that hits like a steam train, offshore bottom bashing on reefs, long casting along the surf beaches or flicking a line from a river bank or dam. Reels are grouped in the following categories: side casting, spinning, bait casting and overhead. Side Cast Reels are ideal for use where the target area you want to fish is a long cast away. The best side cast reel ever made is the Alvey. Alvey's are pretty much bullet-proof and are low maintenance. Their best application is in the surf or estuary. They hold large amounts of line and can handle the hard conditions involved with beach fishing. Alvey's come in a Junior Caster model 40B which fits nicely onto a 6 foot or 6 foot 6 inch light weight rod and then go up in size and weight to the other end of the scale which is the 700C5. The 700C5 weighs in at just over a kilo and a half, takes up to 900m of line and has an excellent recovery rate which has been improved by the addition of a rapid retrieve handle plate system. A reel this big needs to be used with a 12 foot plus rod and is for serious tailor, jew or shark fishing. Spinning Reels are the most commonly used reels for their ease of use and often lower starting price. They make up the majority of all reels made world wide and can be used in a wide variety of applications. Spinning reels are the most simple to use and novice anglers usually start with Spinning reels. They are exceptionally adaptable for casting any bait, from the lightest lure to a heavier whole mullet (dependant on line strength of course). My personal preference is an Abu Garcia 800 Series in the Cardinal make, as I believe that they are the best spinning style reel that Abu has ever made and I've had many successful catches on these reels. Baitcasters are very unique and take much practice to perfect your casting technique. They're built for precision casting, with magnetic spool control and a centrifugal drag to control how fast your spool spins. The low profile styles with thumb bar fit into your palm for all day castability. The Abu Garcia 5600 C4 is still made in Sweden and is a good all-round bait caster which is also reasonably priced. Overheads are easy to use and do all the hard work for you. They're good for trolling, bottom bashing and casting big baits. Generally overhead reels have powerful gears, tough drags and large spool capacity. I would recommend the Convector 30L as a good all round reel for trolling and bottom bashing. Composition: If you are planning to fish the majority of the time in salt water, then look for a reel made purposely to withstand a harsh saltwater environment. The reels which frames are made from a lightweight aluminium alloy will last longest without giving into corrosion. A high-strength reel body means the reel will be incredibly strong while still maintaining a minimal weight. Graphite or a combination of graphite and metal sounds stronger but under extremely intense pressure and loads it can shatter. Graphite is also much dearer as it takes more power to create. Aluminium alloy is stronger and will hold up better against the force and pressure of a trophy-sized saltwater fish, including ones which are extremely large and vicious in their fight for freedom. Drag Systems: When buying a spinning or bait casting reel, anglers can choose either a front/rear drag system or lever drag system. A front/rear drag uses pressure is increased or decreased by turning the "wheel," located just inside of the handle or on top of the spool. The tighter you turn the "wheel" the tighter the drag is set. While front/rear drag systems are simple to operate and are fine for most applications, lever drag systems typically supply smoother, more consistent fish-fighting performance. Most lever drags also allow for drag tension to be adjusted in smaller, more precise increments than star drag systems. If there is a downside to lever drag reels, it's price - they tend to be more expensive than top drag reels. Ball Bearings: Spinning and bait casting reels all feature either ball bearings or bushings strategically placed within the reel for smoothness, support and stability. Many spinning reels also feature a roller bearing within the line roller. When it comes to smooth performance and durability, sealed stainless steel ball bearings are preferable over bushings. Generally speaking, the more ball bearings a reel has, the more smoothly it will perform. Quality reels typically feature at least two stainless steel ball bearings. Top-of-the-line reels can have up to twelve ball bearings for deluxe spinning. Gear Ratio: A key consideration when purchasing a reel is gear ratio, which refers to how many revolutions the spool makes with each complete turn of the reel handle. This determines how rapidly line is retrieved as the angler winds the handle. Reels with high-speed gear ratios are better for working lures quickly back to the boat, or gaining line in a hurry. Low gear ratios don't offer as fast a retrieve, but provide the greater cranking power ideal for bottom fishing and trolling applications. Spools: The composition of the spool should be a consideration when purchasing either a spinning reel. Spinning reels typically come with either an aluminium spool or a graphite spool. The anodized aluminium spool offers greater strength and durability than graphite spools, which can break or crack under torque. Many reels now come with a spare spool, often made of a plastic or lesser quality material because this spool is a spare or alternate spool for storing extra line. Be sure to consider the line capacity and length your reel's spool can take as this will influence where you will be able to cast this reel. So now you are geared with enough knowhow to be able to make an informed decision on what you need in a reel. Noosa: Dart and whiting along Sunshine Beach and the North Shore to Teewah. Excellent reports of tailor along the North Shore and also up to 3kg in Woods Bay. Flathead in Weyba Creek and scattered throughout the lower reaches. Good bream up to 1kg overnight around Makepeace Island and around the Noosa Ferry crossing. Maroochydore: Plenty of reports of tailor being taken over night and dawn and dusk along the north shore. Good flathead on small neutral colour soft plastics in the lower reaches. A few luderick around the Motorway Bridge pylons. Schools of tailor and the odd jew moving between the Cod Hole and Bli Bli. Bream throughout and chopper tailor and flathead near the sand bags at Cotton Tree. Kawana: Tailor, dart and bream between Point Cartwright rocks and Kawana Surf Club. 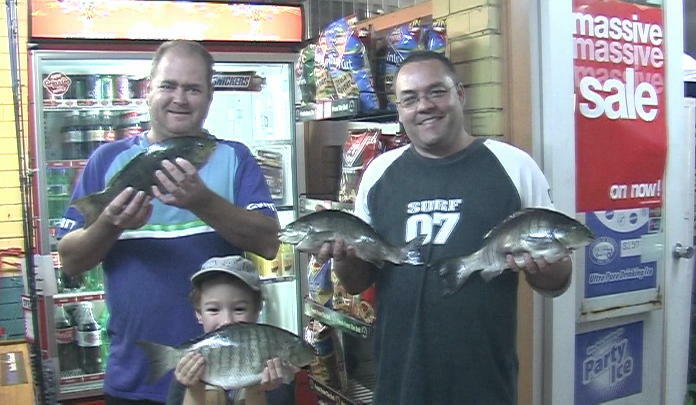 A few bigger bream and tarwhine along Kawana beach over night. Bream on mullet fillets and big schools of gar fish between the boat moorings and the mouth. Flathead on the drift in the lower reaches of Mooloolah River. Caloundra: Tailor just inside the bar and out around Brays Rock. Bream in good numbers throughout the passage but best overnight at the Blue Hole. A few flathead in the shallow channels that lead to the bar. Reports of good trevally and queenfish in the Pelican Waters Canals. 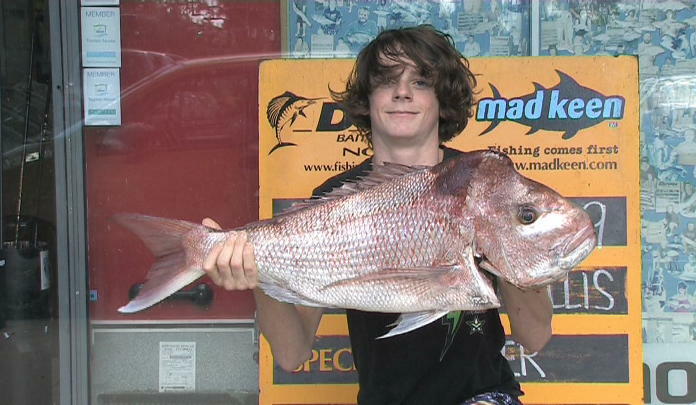 Daniel Hollis boated his personal best 'Knobby', a very nice 6kg specimen, at North Reef (with thanks to www.fishingnoosa.com.au). Although traditionally luderick anglers would use Centre pin or Alvey reels. Jason, Lachlan and Paul prefer to use light bait caster rods with low profile reels that are spooled up with 4kg line to target Luderick like these quality specimens caught in the Maroochy River last weekend. Neil Dale uses a 700 size Alvey Reel to target big jew in the surf because they are resilient in the salt and sand and hold plenty of line. 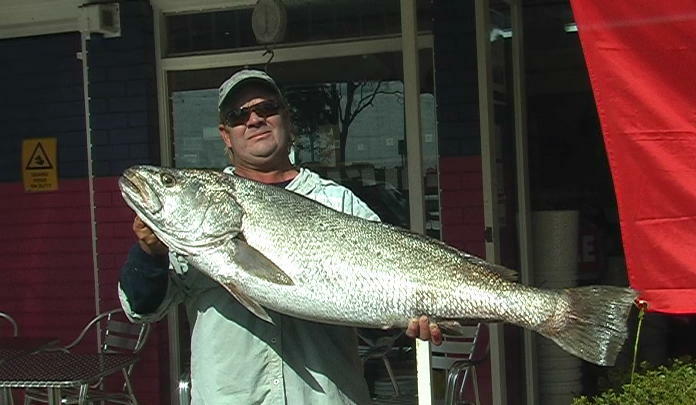 Neil’s fish went 42lb and was taken on mullet overnight from the north shore.